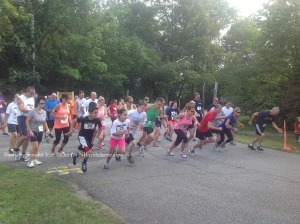 The 5K Participants at the start of the race. Photo by Jennifer Jean Miller. 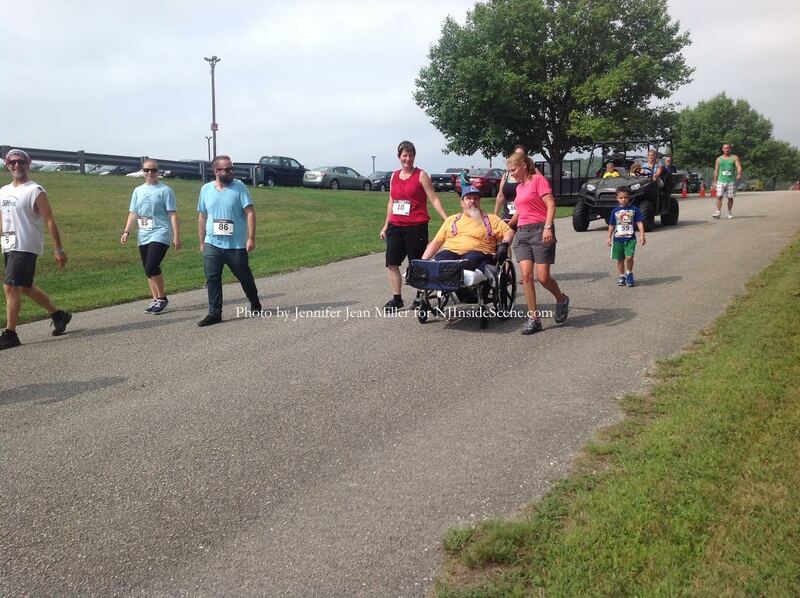 AUGUSTA, NJ – Now an annual tradition for the last three years, participants gathered for the Sussex County Sheriff’s Crimestoppers 5K and 10K runs on Saturday, September 6, at the Sussex County Fairgrounds. 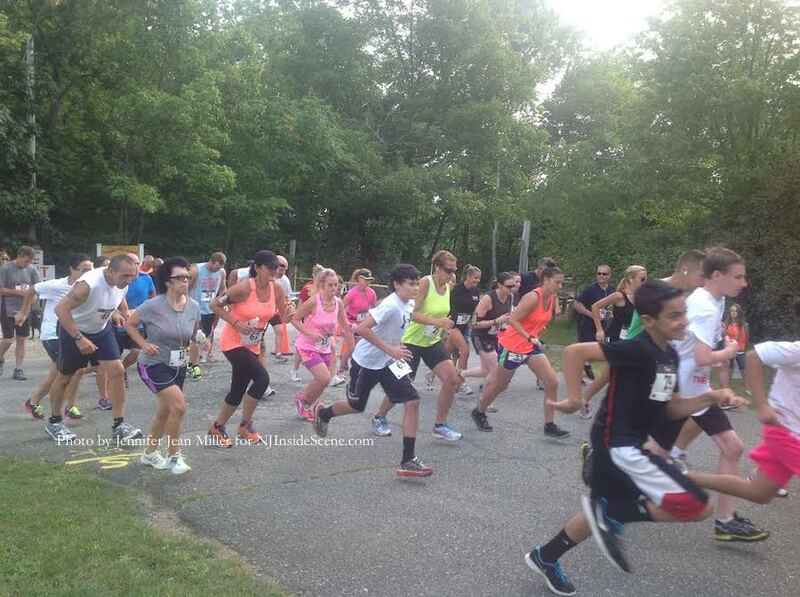 “We’re real happy with the turnout,” Sussex County Sheriff Mike Strada told NJ Inside Scene at the start of the race. The course for both the 5K and 10K winds its way through the area of the fairgrounds, and is considered a flat course that is also amenable for beginners to 5K and 10K races. Strada said participants enjoy the scenic course. Today, the race conditions were more challenging than usual, because of the air quality, which was humid with temperatures in the mid-70s at 9:30 a.m. at the race kickoff time. Conditions were slightly hazy, and temperatures seemed higher due to the humidity. Race director Andy Ball at the start of the 5K. Photo by Jennifer Jean Miller. 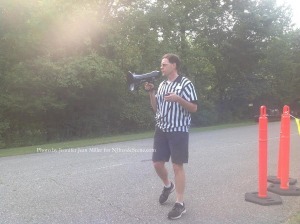 Strada said that the Crimestoppers 5K and 10K is one of two benefit events for the Sussex County Crime Stoppers non-profit group. The non-profit raises funds to provide rewards to those who provide anonymous tips, which lead to an arrest and indictment of a criminal. Rewards can range up to $1,000. The second fundraiser each year is a special fundraising dinner, he said. Runners begin to take off. Photo by Jennifer Jean Miller. Prizes were given out today for the top winners and for the top in the various age classes. Team awards were also presented. 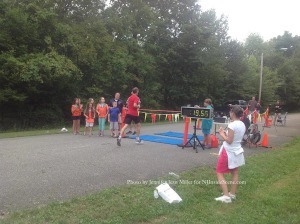 Lee Toussaint of Milford, PA was the overall winner for the 5K, with his finishing time at 19:56.7. Ryan McQuillan of Sparta was the second place participant, at only 13 years old. McQuillan finished at 23:11.4. Lee Liddy of Newton who placed third, overall, came in at 24:08.6. Lee Touissant crosses the finish line. Photo by Jennifer Jean Miller. 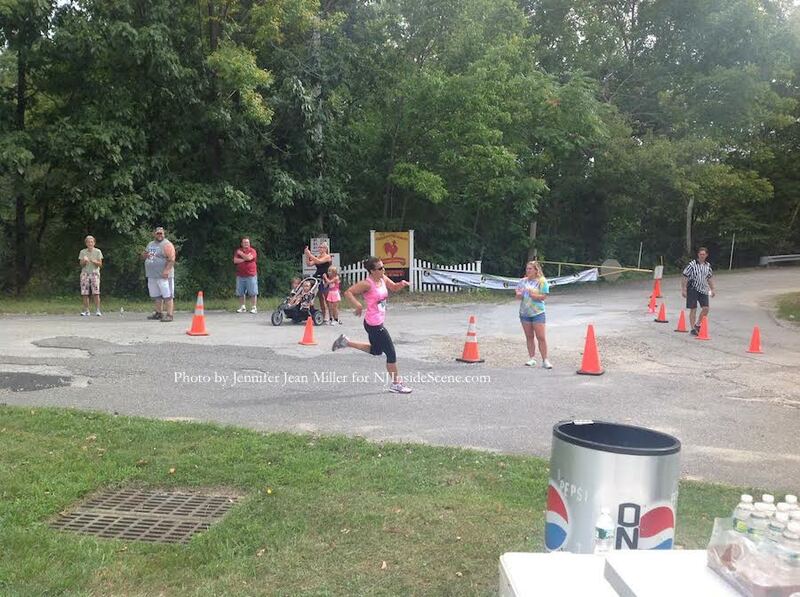 The top female in the 5K was Elise Tooker of Sandyston, who placed slightly behind Liddy, finished at 24:45.6. Carrie Stapel of Franklin came in second place for the females at 24:53.3, and Tami Conway of Hamburg in third at 25:52.3. Elise Tooker heads for the finish. Photo by Jennifer Jean Miller. 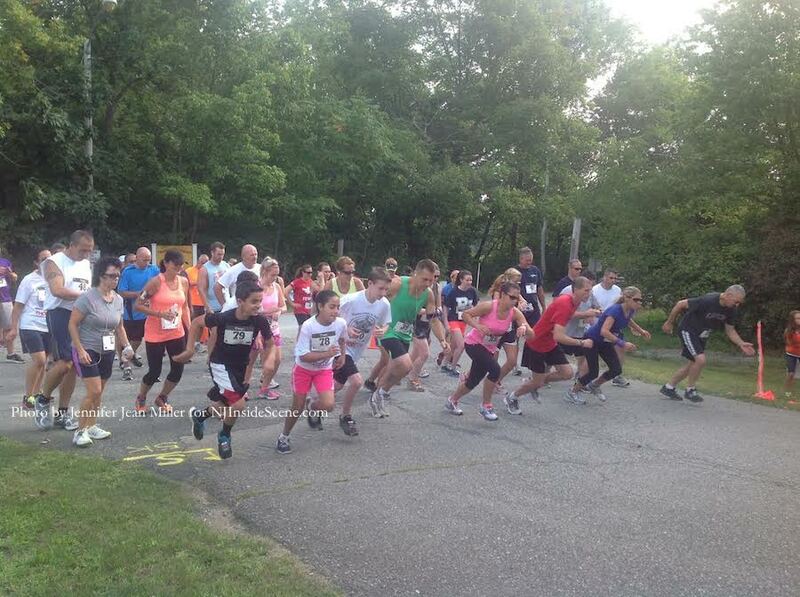 In the 5K, there were 71 registered participants. One of the highlights was the arrival of the team of Danah Petit-Lombardi and Alex Krucinski of Newton, who placed at 68 and 69. Petit-Lombardi is the recreation director of Homestead Rehabilitation and Healthcare Center, and Krucinski a resident. Krucinski, who was spina bifida and Petit-Lombardi who endured a heart transplant in 2013, promised one another that they would complete the race upon her return to duty. The crowd went wild for the pair, and others flanking them, as they neared, and crossed the finish line. Alex Krucinski and Danah Petit-Lombardi, with their team of supporters, heading for the finish line. Photo by Jennifer Jean Miller. The youngest runner in the 5K was Lucas Tordella, age 5, of Silver Spring, MD. Louise Giardelli of Newton was the most senior runner in the 5K at age 60. Tordella and Heather Tordella, came to the race from the most distant location, Silver Spring. The 10K participants included top finisher Statler Willand of Sparta, who completed the run in 39:02:34. Stefan Albinsson of Sandyston arrived in second place at 39:36.99, with David Huse of Princeton, NJ, crossing the finish line at 45:07.08. 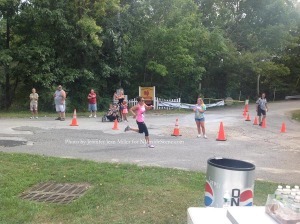 The top female finishers were Megan McDonald of Succasunna at 48:49.7, Debbie Jennings of Newton at 50:18.31, and Dina Faiella of Staten Island, NY at 57:56.87. 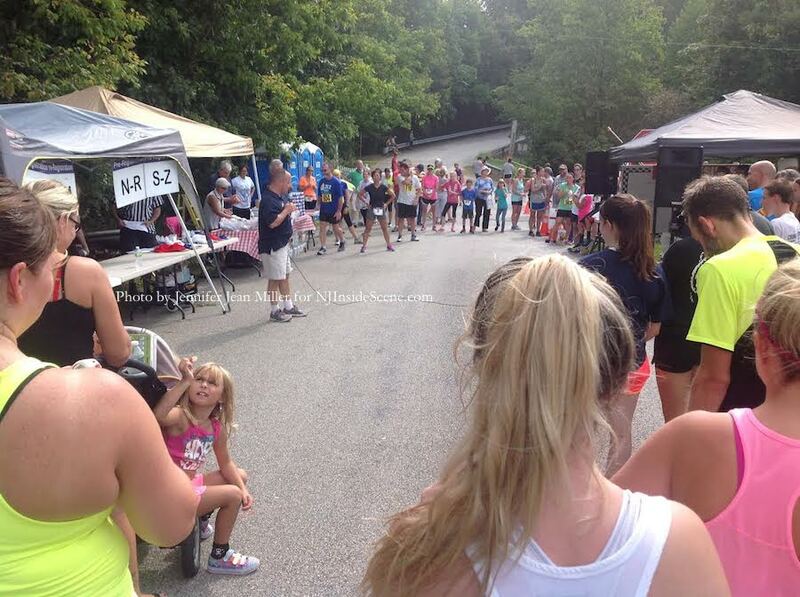 There were 48 participants in the 10K. The participant who came from the most distant location was Shannon Garrity of Anderson, SC. 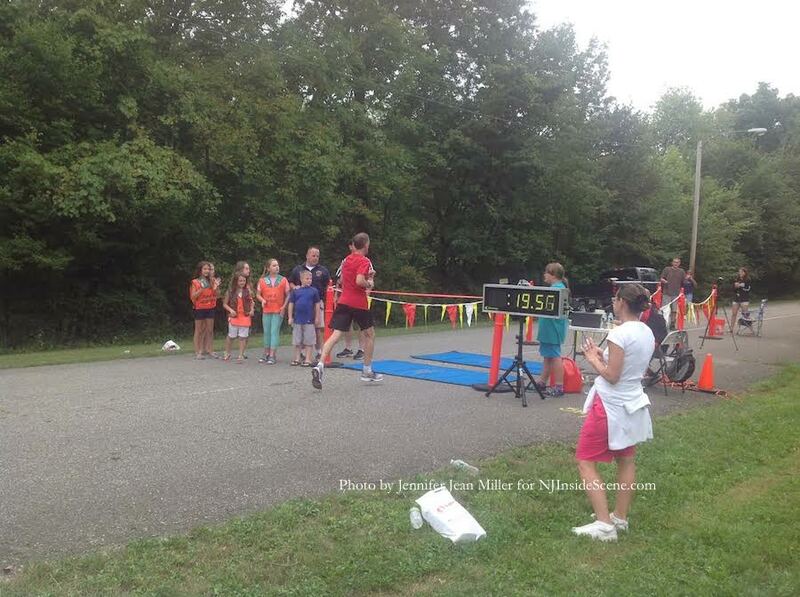 The youngest of the 10K runners was Willand, who is 22, and the most senior was Paul Rockwood of Newton, who is 65. 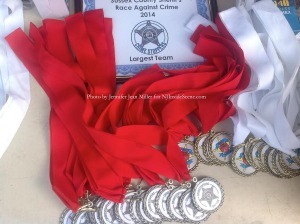 Ribbons prior to be given out at the event. Photo by Jennifer Jean Miller. Click here to view full race results for both races. For those unable to claim their prizes at the race, winners can contact the Sussex County Sheriff’s Office at: (973) 579-0888. “Everybody’s a winner in my book,” Strada said at the conclusion of the race, as awards were being passed out. Sheriff Mike Strada addresses the participants at the conclusion of the races. Photo by Jennifer Jean Miller. The Sussex County Crime Stoppers thanked the volunteers, sponsors, and vendors who contributed to the race. Thorlabs presented the race. Other sponsors included: Strada, Newton Medical Center, CenturyLink, The Morville Agency, Lakeside Construction, Comet Security & Solutions, Hoover Truck Center, PSE&G, Iliff-Ruggiero Funeral Home, Bimbo Bakeries, McGuire Chevrolet, Fredon EMS, Sussex Bank, Franklin Mutual Insurance, Toyota World, The New Jersey Herald, D&H Alternative Risk, Sussex County Clerk Jeff Parrott, Cailey Jewelers, and New Image Landscape Services. 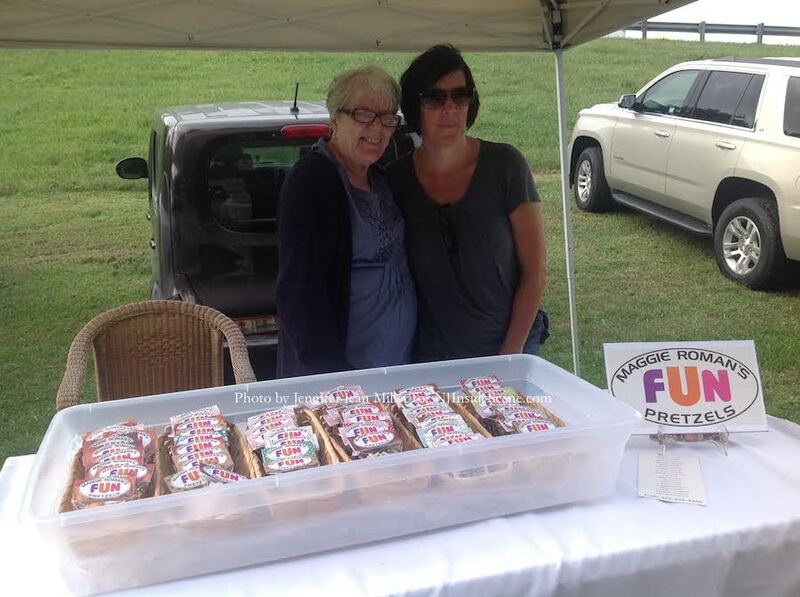 Nancy Vander Berg (left) and Michelle Syre (right) volunteered their time to sign in race participants. Photo by Jennifer Jean Miller. 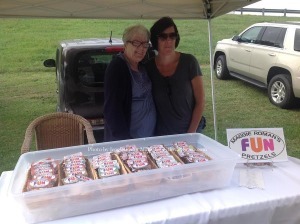 Delia Lowery (left) and her daughter Maggie Lowery (right) with their handcrafted pretzel treats, Maggie Roman’s Fun Pretzels. Photo by Jennifer Jean Miller. 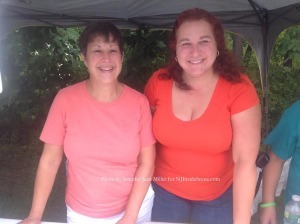 Vendors present at the event included: Nutrition Zone, Maggie Roman’s Fun Pretzels, Thirty-One Bags, and Embrace Massage Therapy. 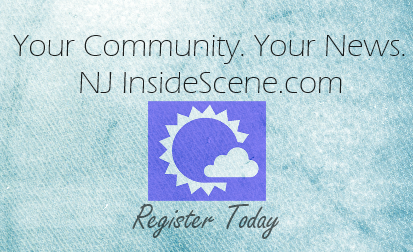 Stay on the scene with NJ Inside Scene…and stay informed about events like this on our site and Facebook Page. Click here to follow us on Facebook.